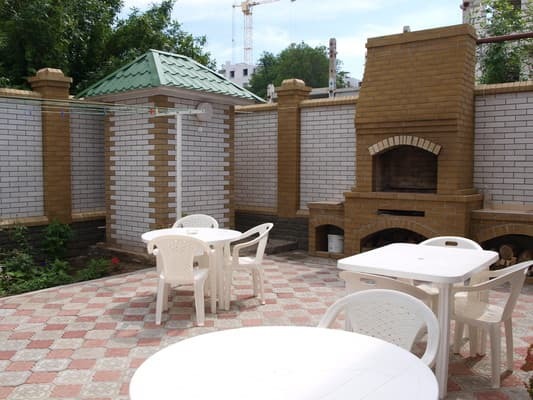 Mini hotel "NaAzove" is located in the central part of the city of Berdyansk in a 1-minute walk (at a distance of 50 m) from the shore of the Azov Sea. 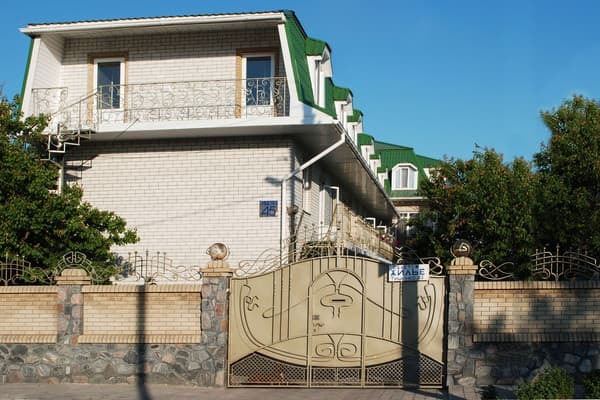 The hotel consists of 3 buildings located on 15 acres of quiet cozy territory. Comfortable 2, 3 and 4-bed rooms of "Junior Suite" and "Lux" class are available for guests. 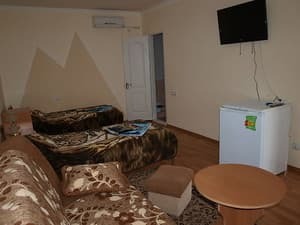 In the rooms: modern case furniture, beds with orthopedic mattress, air conditioning (split system), plasma TV (cable TV), refrigerator, shower, hairdryer, towels, toiletries. The rooms are regularly wet and bed linen are changed. Cold and hot water is supplied around the clock. 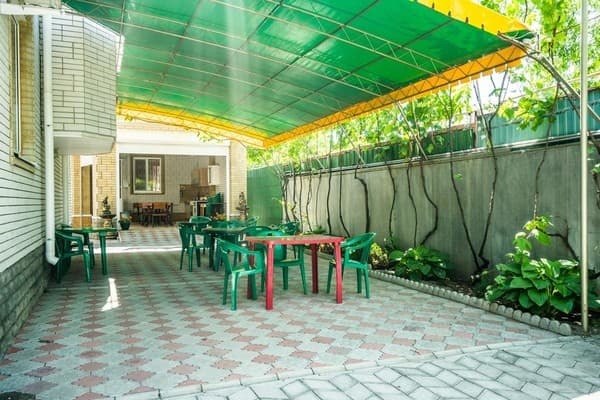 On the territory of the hotel "NaAzove" there are recreation areas with tables and chairs, barbecue grill, guarded (paid) parking, free Wi-Fi access, a children's playground. 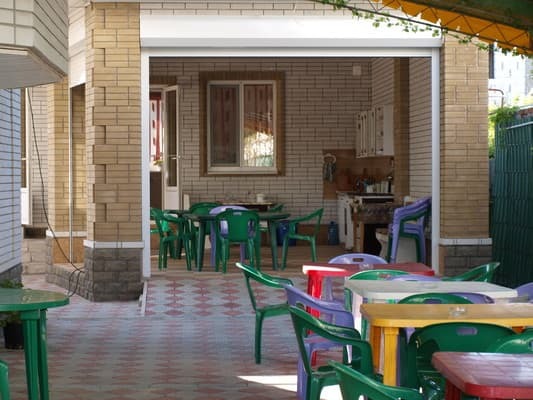 There are also fully equipped two kitchens with all the necessary equipment for cooking. The distance to the bus station is 15 minutes drive, the railway station is 10 minutes walk. Description of the room: Spacious room, equipped with modern furniture and upholstered furniture, double bed with orthopedic mattress, wardrobe. Description of the room: Spacious room, equipped with two single or one double bed with orthopedic mattress, wardrobe, necessary cabinet and upholstered furniture. Description of the room: Spacious room with double bed with orthopedic mattress, closet, necessary furniture and furniture. Тихо, спокойно, чисто и просторно в номерах. Замечательная хозяйка! Грязное море, мало места на пляже. 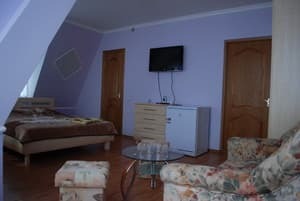 Accommodation of children up to 3 years - 50 UAH (surcharge for utilities). The hotel has an equipped kitchen for self-catering. There is a possibility of ordering 3 meals a day. 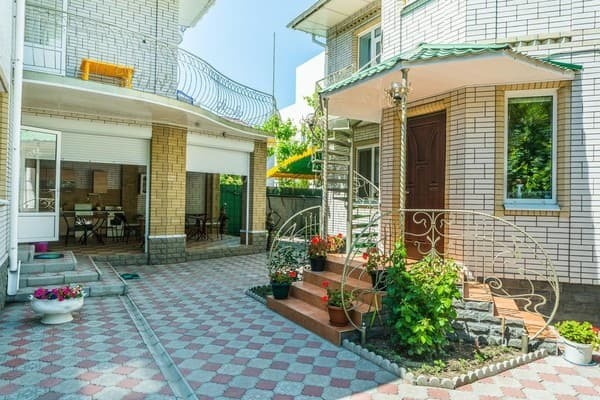 Mini hotel "NaAzove" is located in the central part of the city of Berdyansk in a 1-minute walk (at a distance of 50 m) from the shore of the Azov Sea. The distance to the bus station is 15 minutes drive, the railway station is 10 minutes walk. There is a shuttle service for guests.